The meeting weekend that students who participate in the Student Exchange Programme (SEP) in Portugal, is going to take place in the “Azurara Park Adventure” in Vila do Conde from the 22nd July to the 24th July. 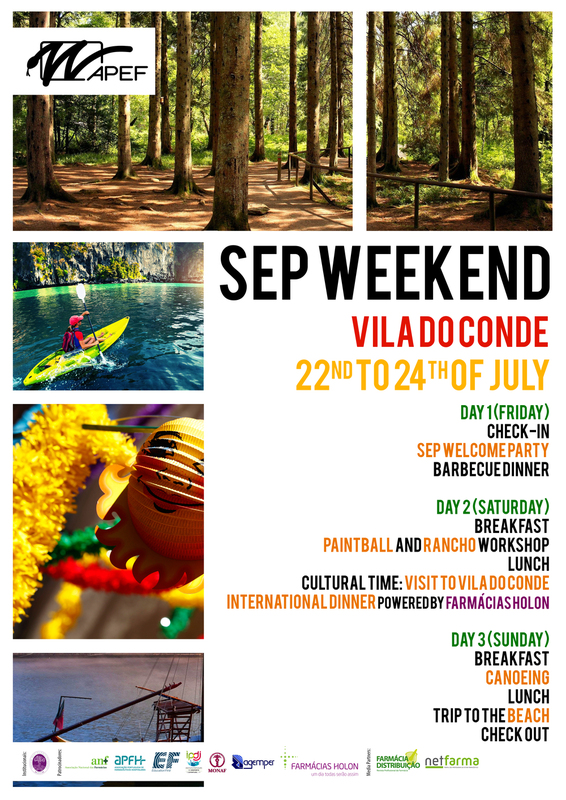 With a complete program that includes extreme activities like canoeing and paintball, a rancho workshop, a trip to visit the sea and to Vila do Conde, these amazing days are filled with lots of activities and many surprises! – Type 2: 55€: Accommodation in a tent, which does not include sleeping bag or bedroll (you can order the bag bed + extra mattress). The food is included in the total price of the activity and include: Friday night dinner; breakfast, lunch and dinner of Saturday and breakfast and lunch on Sunday. The form will be available from 26th June to the 3rd July, 2016 (midnight). The payment of the activity should be made by paypal within 48 hours of the submission of this form and you must submit proof thereof to tesoureiro@apef.pt in order to validate your subscription. Note that the amount transferred must be the total value of what’ve selected this form. Read here the Paypall guide! Any questions, please contact seo@apef.pt. O fim-de-semana de encontro entre os estudantes que realizam o Student Exchange Programme em Portugal chegou, e este ano decorrerá no Azurara Parque Aventura de 22 a 24 de julho. Com um programa completo que inclui atividades radicais como canoagem e paintball, um workshop de rancho, visita ao mar e ao centro da cidade de Vila do Conde, será recheado de atividades e muitas surpresas! – Modalidade 2 com preço 55€: Alojamento numa tenda, que não inclui saco-cama nem colchonete ( poderás pedir o saco-cama + colchonete extra). A alimentação está incluída no preço total da atividade e incluí: jantar de sexta, pequeno-almoço, almoço e jantar de sábado e pequeno-almoço e almoço de domingo.